Are you ready to release the rage? How Many of You Have Dreamed of Smashing a Malfunctioning Printer? 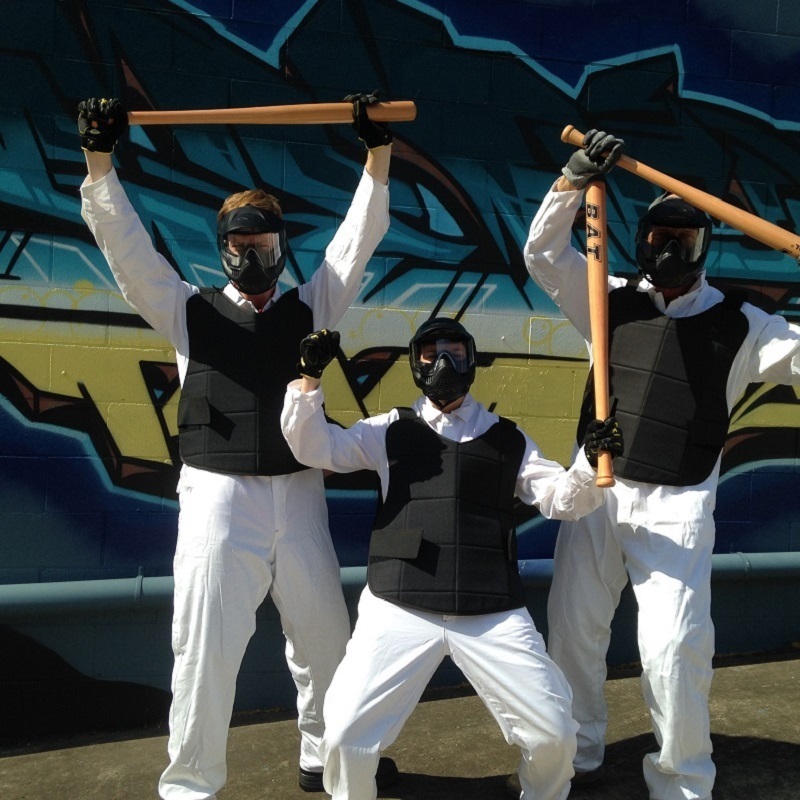 There's a new activity that's proving to be a real smash hit with people on the Sunshine Coast. 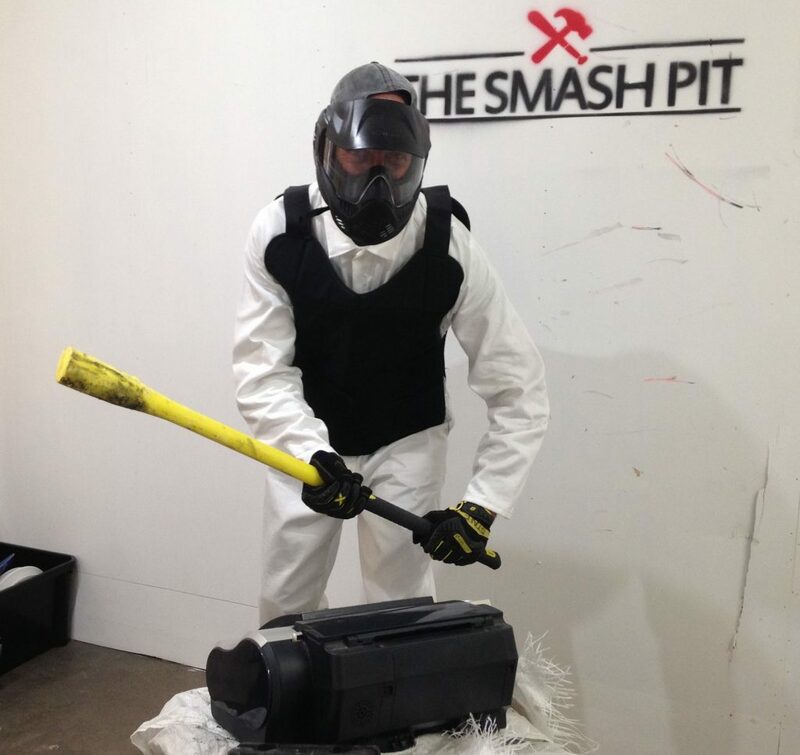 The Smash Pit gives you the chance to blow off some steam while you smash stuff up in a safe and fun environment. If you've seen Office Space or you've ever been very frustrated at a computer, you may have been waiting for this very business to exist. The Smash Pit is the first of it's kind in Queensland and only the second ever smash room in Australia. It's been open since October and has been relieving people's tensions since. I spoke with Suzie, who says she started The Smash Pit for fun, among other reasons. K: Why did you start The Smash Pit? S: In today's society most people don't get the chance to go out on the farm and break bottles. I wanted a safe environment where everyday people can just let go. K: What was the inspiration for the The Smash Pit? S: I saw a similar concept in America a few years ago. I have been tempted to do since then but last year just thought. "Let's do this". Surprisingly The Smash Pit wasn't inspired by this scene... but I was! K: Was it hard to work out all the safety needs? What did you have to do? S: Although all clients sign a waiver, obviously safety is our highest priority. So we have provided all that is required. Safety boots, thick coveralls, face shields, chest protection, heavy-duty gloves. All our staff have current first aid certificates. Rules are in place to protect clients such as you must be over 18 to enter, be sober, be wearing footwear at all times. K: How have people been reacting to it so far? What have they been saying? S: Every single client that has left The Smash Pit since we first opened in October have been grinning ear to ear. I think that says it all! K: I see there is a package where you can BYO things to smash, any advice what to bring and what not to bring? S: You can bring your own crate of stuff to smash and get 10 minutes in the room. Most popular items to bring are laptops etc. We will swap out your wine and spirit bottles to our cleaned and sterilized ones. We won't allow beer bottles in the room due to the smell. K: Are people coming from far and wide or is it mostly locals so far? S: Most of our clients are from Brisbane and surrounds. Some have travelled from as far as Stanthorpe just to visit us and then returned home. In their own words "Completely worth the 4-hour round trip". Clients are making a day of their trip up from Brisbane and visiting other businesses on the Sunshine Coast. We would love more locals to experience this unique adrenaline rush. K: Anything else you would like to tell people about The Smash Pit? S: All our items that are smashed in The Smash Pit are purchased from local not for profits. They are already cracked or broken and are unsaleable. We are saving the NFP from sending them to the tip by purchasing items they wouldn't normally be able to sell and giving them another use before we send them all to The Recycling Centre. 1 crate of items and up to 10 minutes in the pit. 1 crate of items and one electrical item. 2 crates of items and 2 electrical items. 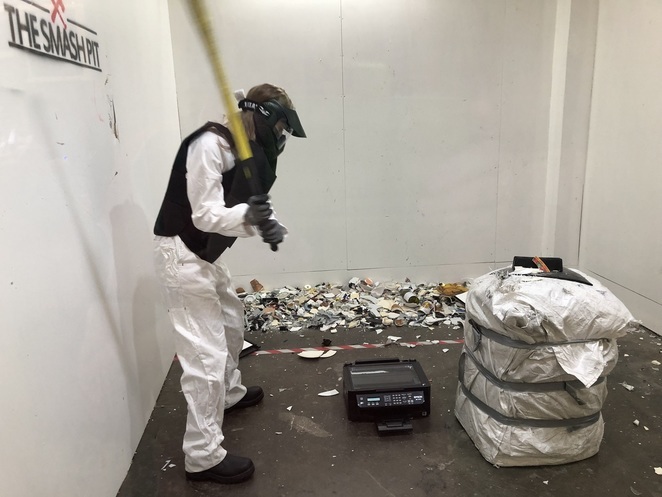 You get 10 minutes in the pit to smash up your own items. Suzie recommends The Mega Smash for a group of four and The Break Up for two people, but you can book those big packages and go solo if you have a mighty rage to tame. There's only one person at a time in the pit, so if you go with a group you'll need to take turns. Suzie and The Smash Pit crew will provide the room, items to smash, a bat and lots of cool looking safety gear to wear during your session. Whether it's for fun or stress release, you're sure to have a great time at The Smash Pit. March Madness special on right now. Book a Classic Smash for just $25. See the website for details. When: Open Mon-Thurs by appointment for group sessions over 4 people. Friday 4:00pm – 8:00pm. Saturday 11:00am – 6:00pm. Sunday 11:00am – 5:00pm. Please email info@thesmashpit.com.au for enquiries. Cost: Prices vary, see article for details. I like your new profile pic, Kiesten! I've heard of these smash pits and thought they were local to Sunny Coast - oh, I see they ARE in Nambour! Sorry, the Gold Coast category at the top confused me....or are they in both locations?